Havent been following too closely, but I heard stuff about glass touch screens and new ipods and new macbooks...blah blah. well, after loving...relying, on Touchpad pro for my ipod touch, I thought maybe apple had the bright idea to integrate their ipod touch as their touchpad for the new macbooks...like a built in dock that doubles as a removable ipod. cmon...its funn...anyway, if this is what they release, I will be first in line. That's actually a great idea. Imagine if the "docking" of the iPod was only placing it there. Full wireless syncing. Or better; inductive syncing. I.E. very fast! This trackpad thing never happen though, and for good reasons. having used my ipod as a multi touch trackpad on my macbook pro was perfect; aside from it not be flush with the keyboard. this would make sense on so many levels to me...business syncing, itunes syncing (of course), remote control. 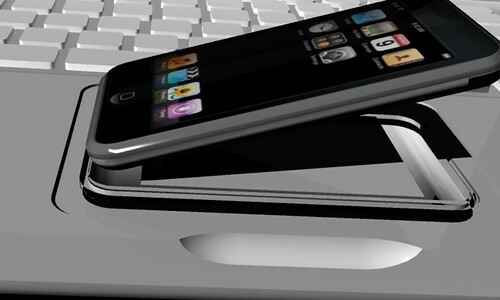 I think it would be nice to have the option of removing the standard trackpad, and replacing it with an itouch. 8gb is $299, subtract mark up and increase quantity, and these things would hardly effect the macbook pricing. I would easily pay an extra 100-200 for this option. btw, inductive syncing would rattle my mind.